Chicago’s Pants On Fire Detective Agency targets liars and cheats. But PI Cat DeLuca is once again up to her smokin’ skinny jeans in murder. Cat is out running in a neighborhood park when she crashes over the faceless body of Bernie Love. Bernie was the finance guy to the scary Provenza family, with whom he grew up. And friend to Cat’s shady, Ferrari-wheeling-cop Uncle Joey. As she hauls out her phone, Cat is assaulted by someone with a Rolex, stun gun, and wheelbarrow. When the cops show up, the killer is gone. And so is the body. Captain Bob, a stickler for habeas corpus, blows off Cat’s story. Stung by a chorus of snickers from the Ninth Precinct, home base for DeLuca men, Cat vows to make her case and goes after Rolex man. The murderer, desperate to silence the only person who can place him at the park, comes after Cat. She’s quickly on a collision course with the deadliest adversary she’s ever encountered—but she has the help of her beagle partner, her gun-happy assistant, an ex-spy (or two), and her outrageous, interfering Italian family. Meanwhile her hot, FBI-boyfriend seems sidelined in Vegas. 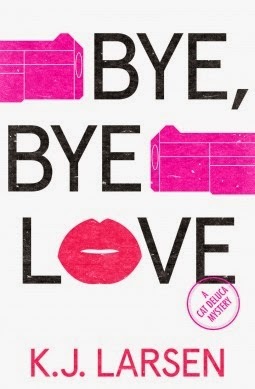 In Bye, Bye, Love, K.J. Larsen delivers another nail-biting tale rife with unexpected plot twists, zany characters, fabulous food, and laugh-out-loud humor. Private eye Cat Deluca was our jogging when she literally trips over a body. A body that disappears by the time the police arrive. Driven by a need to prove that she isn’t crazy, she sets out to prove that someone was murdered. It is during this quest that you meet Cat’s large extended family and friends that include cops and local business men. It takes a Cat and her “village” to solve 3 seemingly unconnected murders. As a fan of Janet Evanovich’s Stephanie Plum series, I was expecting a second rate version given the similarities between Stephanie and Cat. They’re both private eyes with large crazy Italian families. But this is where the similarities end. The authors were able to come up with a completely original story that was just as funny and enjoyable as Evanovich’s series. So much so that I went to my local library to see if they had the first three Cat DeLuca misadventures available.